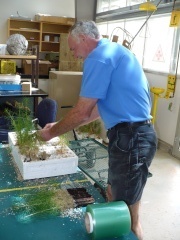 UNBC Greenhouse Curator, John Orlowsky, prepares seedlings for transport. The larch seedlings, sown in December, are now happily in the ground at Aleza Lake Research Forest where they can be observed and measured for many years to come. The process started with watering the seedlings throughly and carfeully pulling them out of the styroblocks (“hot” lifted, meaning they were not forced into dormancy through refrigeration), bundling and wrapping them in clear plastic. After culling out some of the dead and weaker trees, a little more than 2400 seedlings were prepared for planting. Because this is an experimental trial, the trees were planted at high density (2000 stems per hectare) mostly to mitigate any loss from mortality, but also to produce tall straight stems. The seed came from the West Kootenays of British Columbia, so it is expected that the trees will be reasonably tolerant of the ALRF climate and snowpack. Mike Jull explains planting specifications to two of Seneca's most experienced planters. The conditions were perfect for planting the seedlings. Because they are live and actively growing, the moist soils and light rain provide welcoming conditions for the trees to take root immediately. 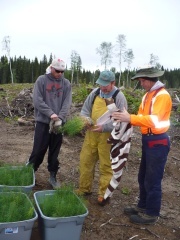 If you would like to visit the seedlings, they are located at the west end of Block 19, located at about 2kms on the East Branch Road. A short 100m walk north of the road and you will have arrived. If you would prefer a guided group tour please contact us.